Beyond the CFL: Winning Images for Energy Efficiency provides new insight into the types of images that get people excited about energy efficiency and supporting energy-saving practices and policies, and those that turn people off. Which images work best to get people excited about energy efficiency? More importantly, what kind of images inspire people to take action to save energy and support policies that drive energy savings? Resource Media’s research into energy efficiency visuals suggests several strategies to make energy efficiency imagery more appealing, inspiring and engaging. Visuals are a powerful way to motivate people to take action in support of energy efficiency—whether through improvements in their own home, or through support for policies. The best images are those that show real people doing tangible things to save energy in their homes and businesses. 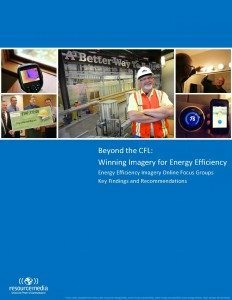 Learn more in our report “Beyond the CFL: Winning Images for Energy Efficiency.” Want the Cliff’s Notes? Download our research summary. Or, check our tip sheet: Ten Steps to Improving Energy Efficiency Imagery. This research is just the first step. There is so much more to learn. Resource Media is continuing to test and refine our understanding of ways imagery can help inspire energy-saving action and support for policies and share what we learn with you. We also invite you to share your own success stories, best practices and questions. Drop us a line at efficiency@resource-media.org.